EXETER – It seems impossible that people living in the world’s most fertile agricultural valley would have trouble putting food on their table, but for many in Tulare County “farm to fork” is more like pie in the sky. Forty-three percent of Tulare County residents are considered food insecure, meaning they lack reliable access to a sufficient quantity of affordable, nutritious food. This may not mean they don’t have food, but rather they can only afford unhealthy foods or that they skip meals in preparation for days they may not have enough money to eat. This could include seniors eating canned beans as a meal, a child stealing another child’s lunch to eat for dinner, or even a mother only buying food preserved with salt or sugar in order to stretch her food budget through the next payday. When seniors on a fixed income, children living in poverty and parents struggling to balance meals with other household costs need access to affordable, healthy food it often comes from a bright metal building at the southeast corner of the city of Exeter. Located among the packinghouses across from citrus groves, FoodLink for Tulare County is charged with feeding 350,000 people each year. The immense responsibility is what attracted FoodLink’s new executive director Susan Manuel. 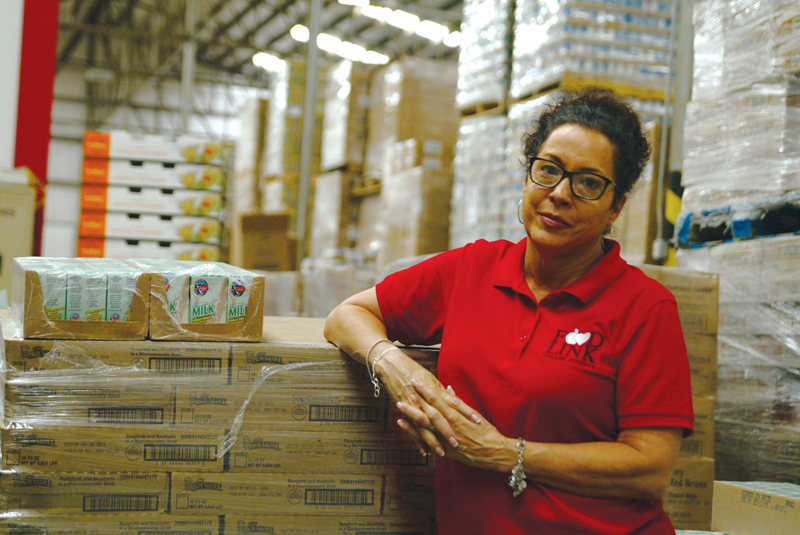 After just two months on the job, Manuel said learning more about the food bank only confirmed her latest career move. Manuel may be new to FoodLink but she is familiar with Tulare County and the non-profits that support its residents. For the last three years Manuel served as director of development for United Way of Tulare County where she built a successful fund-raiser, Power of the Purse, and developed the organization’s literacy project. She also spearheaded United Way’s Diversity, Equity and Inclusion seminar. Prior to that Manuel spent nine years at Ruiz Foods where she was the executive director of their company’s corporate giving efforts. It was during her time with Ruiz where she first realized the importance of FoodLink. As a frozen food company, many organizations would ask for donation’s from Ruiz Foods. Manuel said the company was happy to help but found it difficult to donate food to local food pantries because many of them did not have enough freezer space. She quickly realized that FoodLink could take those donations, store them adequately in a freezer, and distribute them to the pantries that had the ability to store them. It’s also when she came to the realization that canned food donations are important but money goes further in feeding the hungry. She said she hopes to use her mass communications degree and experience in journalism, public relations and marketing to help educate Tulare County about what the food bank does and the importance of what it does. In 2016, FoodLink purchased the former Pinkham packinghouse in Exeter for its 18,000 square feet of warehouse space and its nearly 5,000 square feet of cold storage and freezer space. Manuel said the food stored there is distributed through three core programs to feed the hungry: local food pantries, Nutrition On the Go and the SmartPack program. FoodLink distributes 7 million pounds of fresh produce and canned food annually to 30 food pantries in every city and communities in every corner of the county. Depending on the size of the community, FoodLink delivers monthly to communities such as Allensworth, semi-monthly in Farmersville and every other day in Tulare. It relies on a large group of volunteers to help organize and coordinate food boxes at its warehouse in Exeter and others to help distribute the food out in the communities. Similar to the food pantries, FoodLink’s Nutrition On the Go program brings food out to meet those in need. The program makes monthly stops at food pantries, elementary schools, college campuses, clinics, senior centers and memorial buildings throughout the county. In a partnership with the Tulare County Office of Education, FoodLink distributes fresh fruits, vegetables, baby food, and juice beverages to families in a farmers market setting. The final ingredient in feeding the hungry is ensuring children are getting enough food and enough healthy food to feed their growing bodies and minds. Through its SmartPack program, FoodLink works with school administrators to identify food insecure students who depend on school meal programs to get through the week but don’t have enough food over the weekends. The food backpack for the weekend provides a child with two breakfasts, two lunches, snacks and produce to hold them over until Monday. Like all of the programs, Manuel said FoodLink relies heavily on monetary donations to fund these needed programs. One of the most vulnerable groups struggling with hunger that FoodLink struggles to reach is senior citizens. Manuel said many seniors are shut-ins, unable to afford transportation to food distribution sites, physically unable to use transportation available to them, and are often too proud to accept food donations from friends, family, and especially from charitable organizations. Manuel said she hopes to start a program to help solve food insecurity for seniors, much the way schools do for children. Manuel’s arrival is just in time for one of the food bank’s biggest month’s of the year in October. Starting Oct. 1, FoodLink is celebrating 40 years of fighting hunger by asking people to take the FoodLink 40 Strong Challenge. Individuals on Supplemental Nutrition Assistance Program (SNAP), formerly known as food stamps, receive an average of $31 per week. FoodLink is challenging people to eat on $40 per week to experience what it would be like to subsist on a limited food budget. This means spending just $5.71 per day per person on everything you eat, including breakfast, lunch, dinner, snacks, seasonings and drinks. You can’t use food you already have or food offered by friends and family. As part of FoodLink’s mission, the challenge is to also try and eat healthy. Those participating should then share their experience on social media under the hashtag #FoodLink40Strong and challenge others to do the same or donate $40. On Oct. 27, FoodLink’s warehouse will host the fourth annual Food Day event. In celebration of the national event’s purpose to share health and affordable food, festivities will include food samples, art, games, petting zoo, free produce, a lunch and demonstrations in its on-site commercial kitchen. Manuel is also working on making the space in FoodLink’s warehouse more efficient so that it can store more food to feed more people. To help her do this, she is joined by another new staff member, director of operations Temor Grier. His job will be focused on strengthening the efficiency and capacity of FoodLink’s warehouse operations. Manuel is already putting Grier’s five years of inventory and logistical experience from the U.S. Army and an economics degree from Temple University to good use. She said they are working on warehouse shelving that will allow them to quickly access canned foods based on expiration date and assemble balanced meals for distribution sites more effectively. They are also working on plans to install a solar panel system to offset its $4,000 electric bill to maintain its cold storage and freezer units. For more information or to make a donation, visit FoodLinkTC.org.